The Egyptian Vulture (Neophron percnopterus), a long-lived medium-sized scavenger population in Morocco has undergone a significant decline since the 1980s to the point of nearing local extinction in the twenty-first century. The observation of four birds in Spring 2013 and the sight of a breeding pair near the Tazekka National Park caused immense excitement among the Moroccan and global ornithological community. 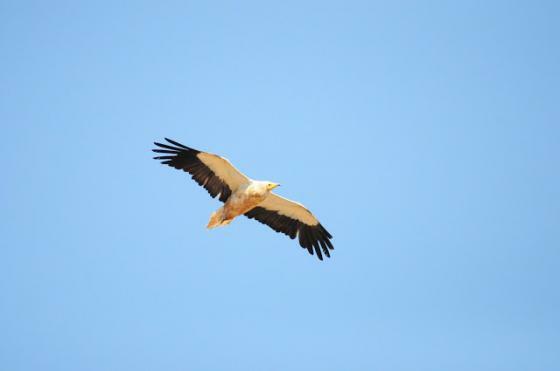 Mohamed Amezian and Rachid EI Khamlichi conducted a self-financed field study of some possible sites for Egyptian Vultures over a six-day period during June 2014 in the Middle Atlas Mountains, Morocco. Mohamed Amezian and Rachid EI Khamlichi counted a total of 48 Egyptian Vultures at three different localities: two occupied breeding sites and one communal roost that hosted 40 vultures of different ages. These results are described in a Short Note, published in Ostrich: Journal of African Ornithology, Volume 87, 2016 – Issue 1, titled 'Significant population of Egyptian Vulture Neophron percnopterus found in Morocco'. The paper is available to access at no charge until the end of November 2016. Mohamed Amezians’ blog post can be accessed here with a French translation here. The hope is that this new situation and the various recent sightings will revive the hopes for studying and conserving this and other vulture species in Morocco and North-west Africa in general. Image Caption: Adult Egyptian Vulture (Neophron percnopterus), Middle Atlas, Morocco.